The single level University Mall, which opened 1973, was the first mall in the Provo-Orem area. The mall is actually located in Orem, a planned suburban city immediately north of Provo. When University Mall opened, it was anchored by Utah-based ZCMI – one of the only major retailers owned by a religious organization, the Mormon Church - and JCPenney. The mall’s opening was a sore point for officials in Provo, who wanted the mall to be located there – in the middle of downtown, but ultimately the developer was won over by the sprawling space offered up by Orem and the proximity to all the college students at BYU, the mall’s namesake. One of the first major changes at University Mall was the addition of north anchor Mervyn’s, a California-originated department store operated by Dayton-Hudson of Minneapolis, in July 1981. In the late 1990s, a war erupted between the University Mall and a developer wanting to build a new mall in south Provo. The new mall’s developer convinced JCPenney to abandon its post at University Mall with a promise of part ownership in the new mall. JCPenney took the deal and ran, closing their University Mall store in late 1997. A lawsuit and local war ensued, even as the new two level mall – Provo Towne Center – opened in 1998, with its sparkling new JCPenney. 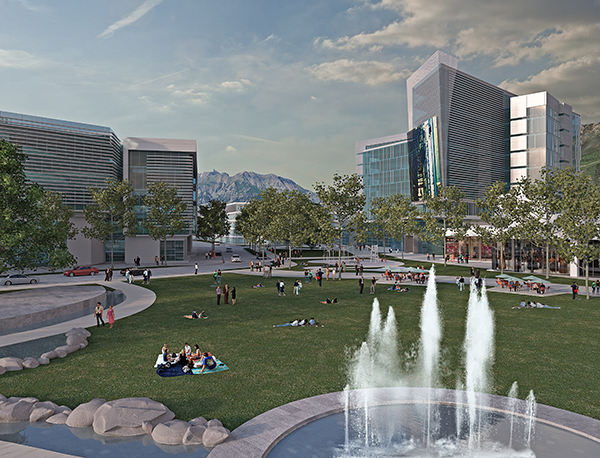 Whether it's an effort to compete with the new mall going into south Provo or simply a spruce-up due after 25 years, a $30 million makeover scheduled for the University Mall ought to, at the very least, attract some attention over the next few years. At the most, it will focus on what some say has been missing for Orem since the town began, a downtown. Woodbury Corp., owner of the Orem shopping center, and mall management officials unveiled their ambitious plans to tenants and merchants Thursday at their annual membership event at Utah Valley State College. The new facility is being designed by Callison Architecture of Seattle. The mall's interior was redesigned to include more light, less bulk overhead, new carpets and wall coverings and in some areas, double floor windows. The main court became "The Village Court" and the focal point for the mall's new personality. The "Tree House Court" area provided a play area for children while their parents shop. The exterior of the mall was made over extensively with towers, glass windows and cobblestones, largely to capture the interest of passers-by on 1300 South. Storefronts opened up to the exterior with pedestrian-friendly exterior walkways that flow naturally into the mall interior. The Village at University Mall, an outdoor ‘lifestyle’ expansion debuted in 2008. Consisting of over 100,000 square feet of retail and entertainment space for 25 stores, the Village is anchored by a 16-plex Cinemark theatre and allows patrons to shop outside and enjoy the beautiful mountain views and fresh air. 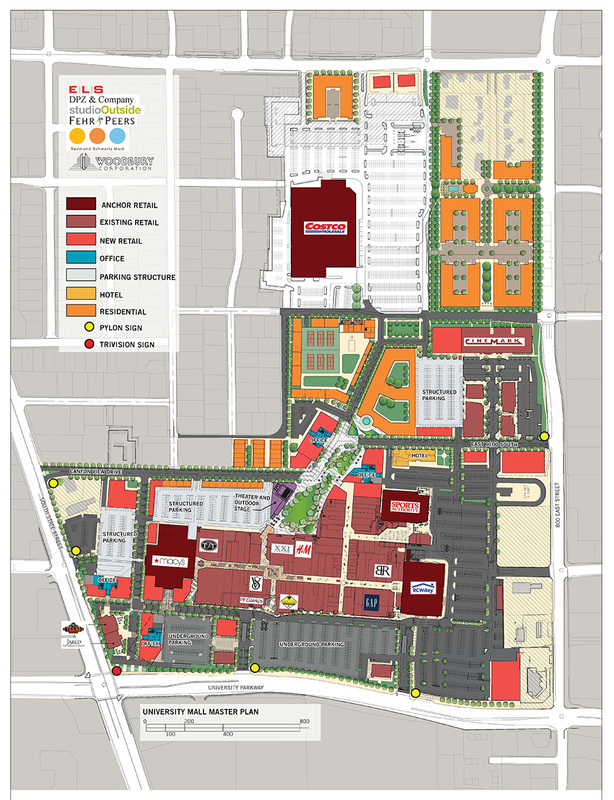 University Mall is changing and expanding from a Regional Shopping Mall to a 112 acre urban mixed use gathering place. The center will continue to have the strong retail element that it now has with over 180 retailers, and will add the elements of high rise office space, housing, large and medium sized Class A office users, residential units including apartments, townhomes and condos and will have a swim and tennis club on site. At the center of the project will be a large park which will be built to host a variety of programmed events for the public. Things from farmers markets, musical performances, exercise classes and other warm weather activities, to ice skating, Christmas events, and other winter activities in the winter. 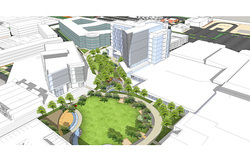 The retail office and residential elements of the project will surround and compliment the park. The unique combination of uses at the center will result in a destination that will have a competitive advantage over other large scale developments in the region. The mixture of uses creates a synergy – the retail benefits from the proximity of the office and residential while the office and residential likewise become more attractive because of the retail. Mixed use development improves economic competiveness by making more efficient use of people’s time. Employment centers, educational opportunities, residences, entertainment, services, and basic needs are all provided within walking distance of each other. At the core of its brand promise is the delivery of a compelling and iconic mixed use environment offering relevant uses and experiences. This development will attract business and visitors from Utah County and beyond. It is one of the most transit connected places in all Utah County. 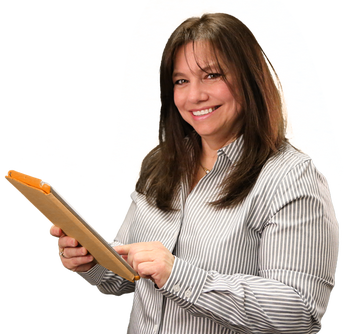 It boasts amenities that reduce the cost of doing business, provides convenience to employees, and help attract new employees and help dramatically expand the public recognition and corporate distinction of the companies that locate there. The Center is an iconic and compelling address. It is the heart and spirit of Utah County’s business and retail corridor.